Just one week before Guardians of the Galaxy hit theaters, Marvel Studios confirmed at Comic-Con 2014 that James Gunn is returning to write and direct Guardians of the Galaxy 2, which is slated to hit theaters on July 28, 2017. Naturally, the Guardians themselves (Chris Pratt, Zoe Saldana, Dave Bautista, Vin Diesel and Bradley Cooper) will be back, but no other characters have been confirmed quite yet. During an interview with USA Today, actress Glenn Close expressed her interest in returning as Nova Prime in the follow-up. "It's so out there, I don't know if people will like this one, but it's really great. Now I've really bought into it. This is a great sculpture, a whimsy on my head. I like to think that Nova Prime has that in her, and hopefully we'll be able to see that in the future. When you play a character who they love and are amused by, hopefully they'll see more of you. Especially at this point in my career, it's fantastic. To be in the beginning of literally a whole new universe for people is really fun." The actress also compared this cosmic outer space adventure to the 1977 classic Star Wars: Episode IV - A New Hope, since both movies aren't entirely serious in tone. "I like to think that anything's possible. It reminded me of the original Star Wars in that it introduced this great cast but it also had this offhand 'We don't take ourselves so seriously' aspect of it. You don't only get introduced into this wonderful world that has a look all unto its own, but the characters make you laugh. You feel some sort of empathy toward them, and people love that and want it." Her performance as Nova Prime marked her first return to the sci-fi genre since 1996's Mars Attacks, where she played the First Lady to Jack Nicholson's President James Dale. She revealed that when director James Gunn asked her to pretend a massive intergalactic war was going on all around her, which would later be added in with special effects, the actress was reminded of her childhood. "It's like what we used to do when we were kids: Let's pretend. For me with acting, I take it to its basic: It's literally playing. Even in the darkest thing, you have to know how to play as an actor and an artist. These movies really bring that out in people." Director James Gunn also offered his thoughts about having the six-time Oscar nominee on the set. "She was a movie star on a set of movie stars, who was so down to earth she'd chill out in the on-set tent with the day players chatting instead of going to her trailer. And her acting, Jesus. Glenn has thousand-pound eyeballs, which add weight to everything she says. I don't know if there's a better quality a film actor can have." 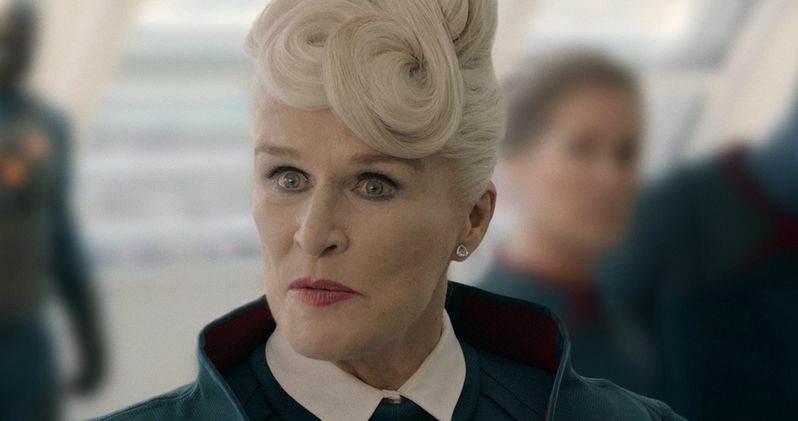 Although she does hope to come back for the sequel, Glenn Close admits that she hopes she never has to get into one of the massive Nova space suits from the comics. "That I hope I never have to get into, unless they put my head on somebody else's body." Do you hope Glenn Close comes back as Nova Prime in Guardians of the Galaxy 2? Chime in with your thoughts below.